The last year or two or so, I’ve been mulling over the idea of starting up a port barrel as port is probably one of my favourite tipples to relax with. I’m fond of a good whisky, that is true, but port is always the one to which I chill out. Of late, I’ve been drinking cask ports too, the quality while somewhat basic, has been fine. The thing I like about the cardboard box is the tap and being able to put my glass under and fill up. Plus it tends to keep well. However, the biggest plus of having your own port barrel is that you can use it to mature, or blend, a port to your liking…even a basic port can improve with a bit of time in the barrel. I’ve read quite a bit here and there on what to look for and how to manage it. Mid last week, I got an SMS from a mate, asking if I fancied a trip to the Hunter on the weekend with a few friends. I try not to say no to Hunter trips :-) We always try to visit a mix of old and new wineries on each such trip and I specifically asked if we could visit Draytons as I’ve long loved their port, dating back to when they used to do ceramic jugs. I figured if anyone in the Hunter sold barrels it would be them, though there’s no mention on their website. Sure enough there was and I ended up buying an 8 litre barrel + a 10.5 litre plastic drum of rich tawny port with which to season it. Now that I have said gear, this weekend I will fill the barrel with warm water…possibly a few times. This will allow the wood to expand and become watertight ie barrels initially will leak so you need to do the water stuff before you do the port stuff. 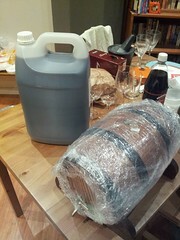 Once the water phase is out of the way, that can take up to 24 hours, I’ll then fill the barrel with the tawny. Due to the ability of the wood to absorb the port, it will probably take more than 8 litres to fill. The bloke at Draytons suggested I keep some of the port in a separate jug so that I can compare it with the what’s maturing in the barrel. Sounds like a neat idea. Except I have that song from Flanders and Swan “Have some Madeira m’dear” in my head! hee hee! Heh heh…I think it would be nice to eventually have 2 or 3 barrels going including one for tokay. Will see how the first one goes.